Sermons of Hope - About our featured author and speaker, JW "Bill" Lehman. J.W. "Bill" Lehman is the featured speaker and author here at Sermons of Hope. Following service as an American pilot in World War II, Bill returned to his native South Dakota to discover his bride, Rose, had become a Christian in his absence. Intent on proving Rose's new found religion a farce, he soon studied himself into her church, enrolling in college to study for the ministry. Bill has served as a missionary in Rwanda, Africa and pastored in several areas of North America. He also served as a revivalist and a "pastor's pastor" in Canada. 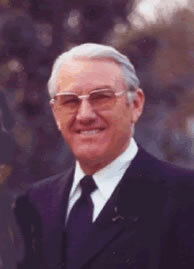 Even after his retirement in 1985, Bill continued in the ministry, speaking and counseling, until his death in July, 2001. The sermons and books on this web site were inspired by Bill's love for Jesus and his prayerful study of the Scriptures. Bill had a real heart love for people, and he longed to see them respond to pleadings of our Heavenly Father: "My son, give me thine heart ..." Proverbs 23:26.